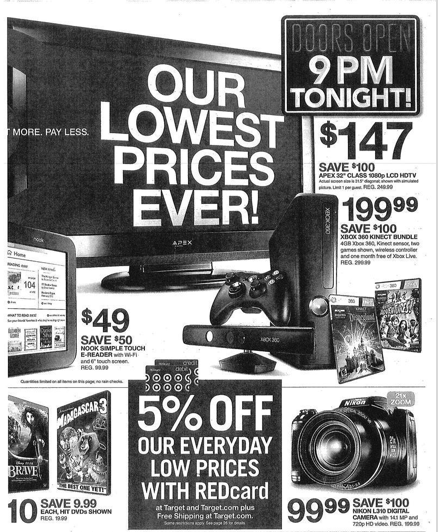 The Target Black Friday Ad 2012 has been released online. Don’t forget to sign up to receive all of the Black Friday Ads as they are leaked. Target will open at 9 p.m. on Thanksgiving night and there are a few doorbusters that are only available from 4 a.m.-11 a.m. on Friday morning. Friday 4 a.m. to noon only! Friday morning from 4am – 11am only! See the complete Target Black Friday Ad here. Looking for more? Read more posts about Black Friday Ads 2012 & Black Friday Deals 2012 & Target Deals.